This jig head uses the bronze O’Shaughnessy hook that has the length and strength to handle the big fish. Weight Choose an option1/8oz.1/4 oz. 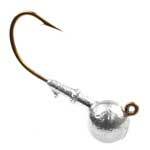 This jig head uses the bronze O'Shaughnessy hook that has the length and strength to handle the big fish.